For the second time in their 10 year careers, Sket-One and Huck Gee have come together to bring you their latest creation, Hazardous Taste, a custom 8" Dunny. 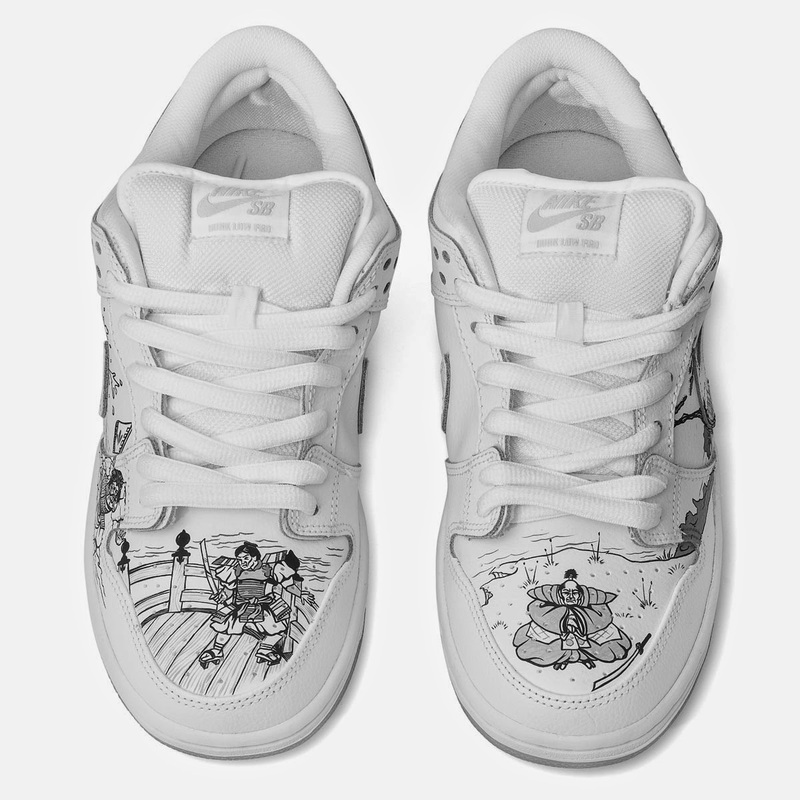 Okay, this is actually the second time in a few months that these two artists have teamed up and it's likely(depending on how the sales go for these) that there may be another version in the future. This GID Custom Dunny features the Skullhead work of Huck Gee and combines that with the signature Dunny bottle design work of Sket-One. 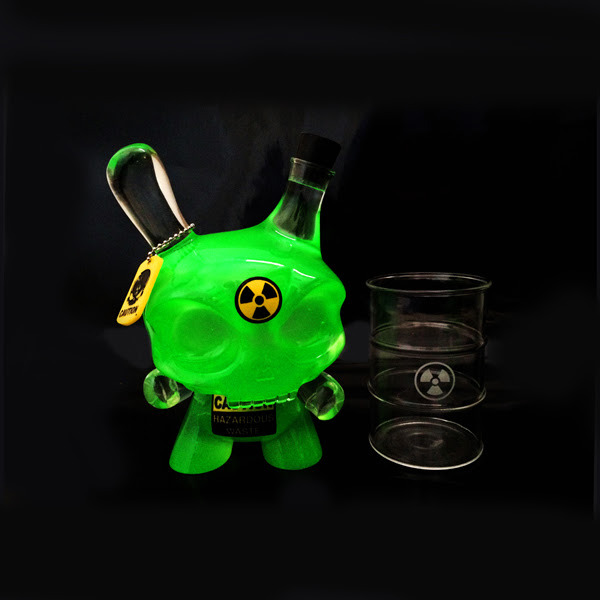 The outcome is one nuclear 8" Custom Dunny, which is only going to be available to purchase during a 24 hour window. 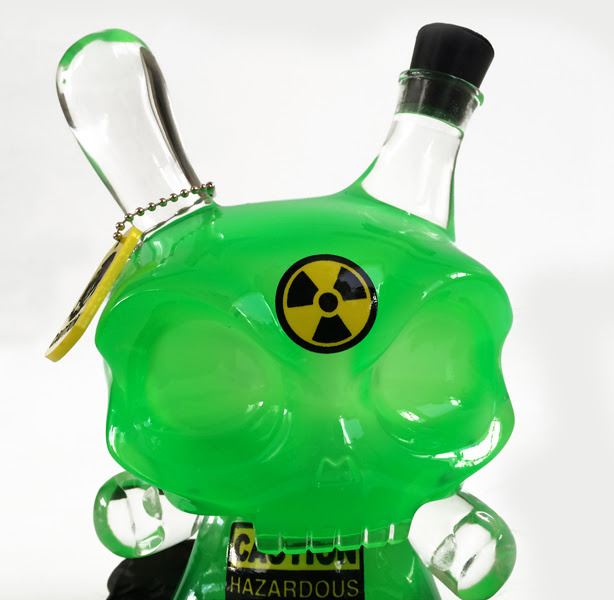 Retailing for $475 plus shipping, Hazardous Taste will go live and be available to purchase from Midnight on Friday the 13th of June 2014 to Midnight 24 hours later, Pacific Time. A fitting date, considering the overall theme of the custom is quite deadly. 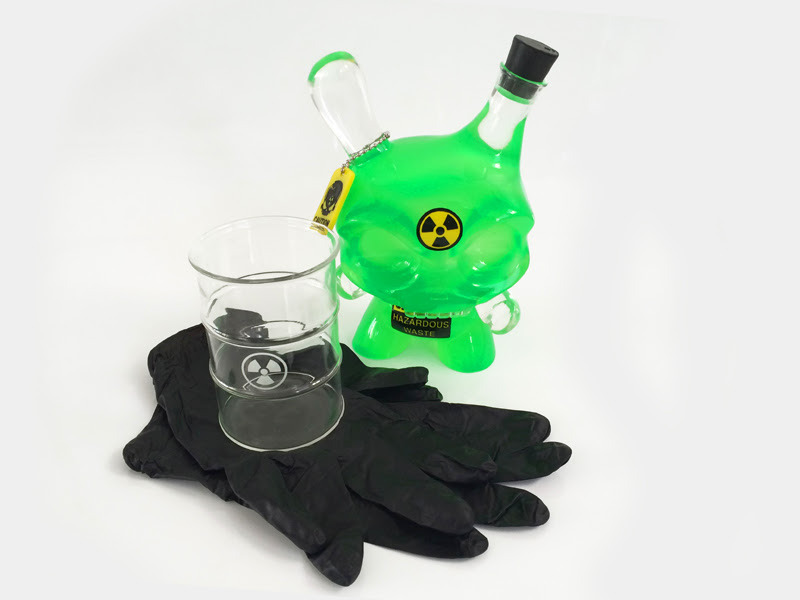 Keep in mind that each custom will come signed by both artists, and should include(unconfirmed) the clear nuclear waste Barrel, Gloves and custom Hang tag. This should be a nice addition to any GID collection shelf. Will there be another version? Who will either artist team up with next? Can everyone's bank account take so much awesomeness in such a short period of time??? Only time will tell. In the meantime, for those who are so inclined, be sure to set that reminder to make a purchase because once the time is up, no more orders will be taken. We all know what the costly alternative is when one sleeps on a release. 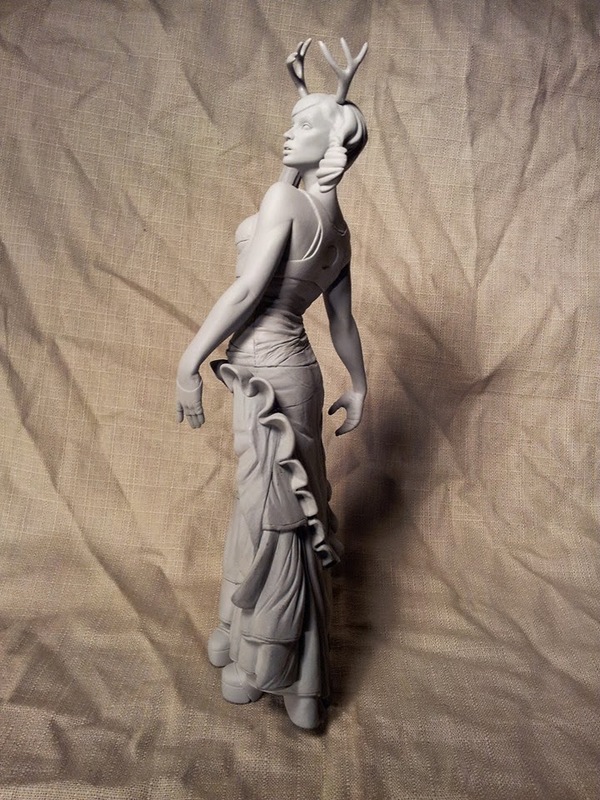 Ahren Gauthier, from Improbable Cast, recently revealed a wonderful 1/7 scale figure (~10") aptly titled Kato. 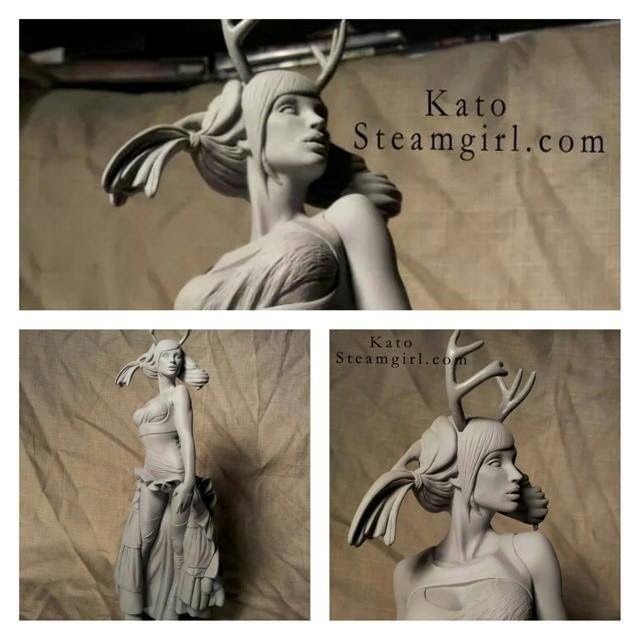 This fully licensed sculpture has been in the making for some time now and is based on an original design called "The White Buck", which is a SteampunkCouture.com collection piece from 2011, designed by the artist Kato(artist and designer from Steamgirl). Licensed figures and sculptures is something that needs to occur more in the Designer Toy world, especially with the ever increasing shift towards DIY resin. Often times, artists take liberties and produce whatever he/she wants. 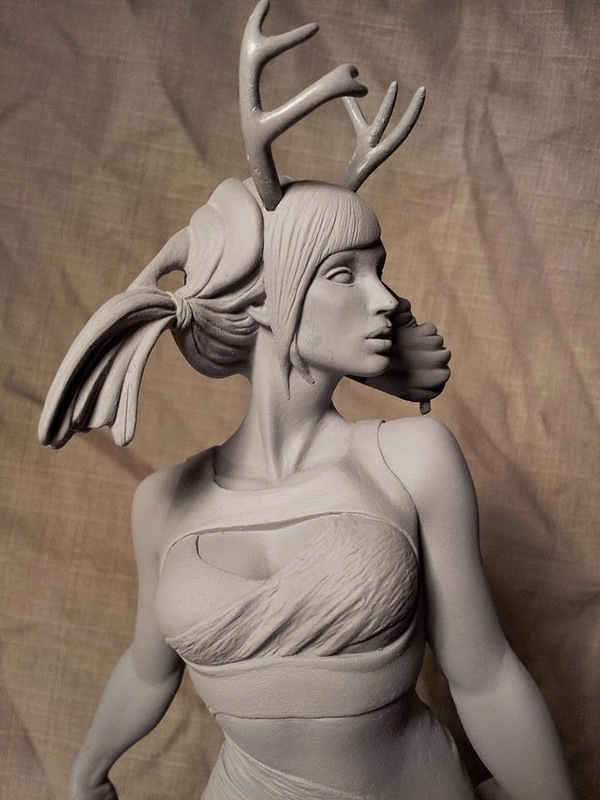 For the Kato/White Buck sculpture, Ahren received a license from Kato to produce a sculpture based on Kato's work. 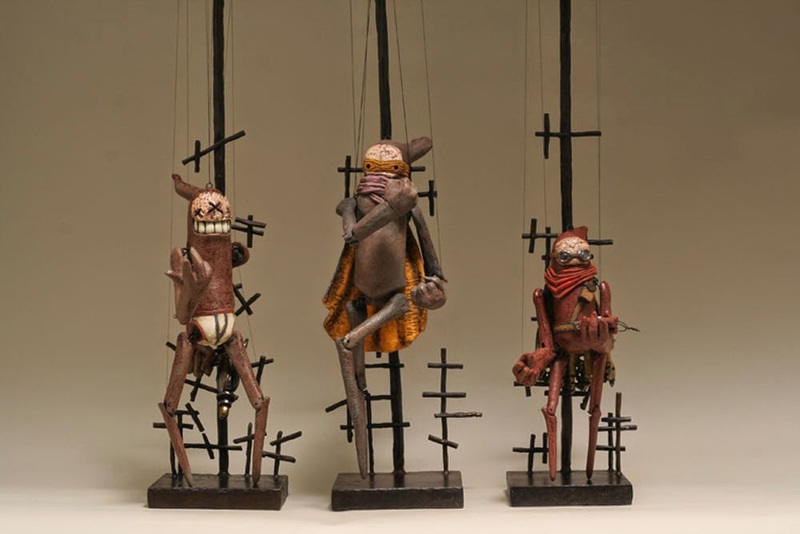 This project was a true collaborative effort in that the design is by Kato, Ahren provided the art direction, while the actual sculpting was a collaborative effort completed by Barsom Manashian and Sue Beatrice. Sue Beatrice has an album on her Facebook page, linked here, dedicated to the sculpting process for the Kato Sculpture. When it's all said and done, this prototype piece turned out amazing. 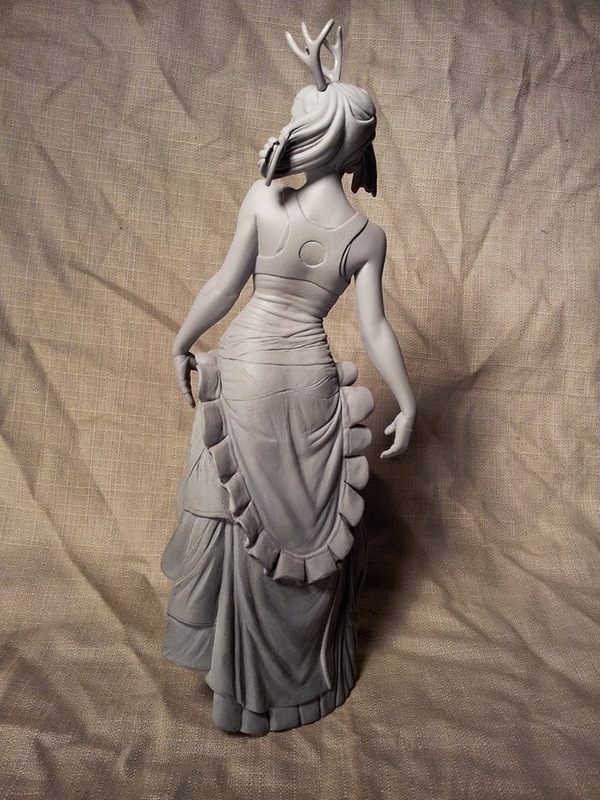 Ahren's plan is to release different versions of this sculpture. There will be a version with a sculpted skirt, as seen in the pictures, as well as a version without the skirt with bare legs which will come with fabric to construct it. Tentative pricing for an unpainted version of Kato will be around $120, while a painted version will go for $175, plus shipping (pricing depends on location). Email ahren@improbablecast.com for full info and to be added to the mailing list to be notified of the launch. Production will commence very soon and a preorder system will be made available. Thanks to everyone involved with this project, I could not be more pleased with how this project came out! Paying homage to Friday the 13th series of 80’s slasher films, this release focuses particularly on the second installment where we see our anti-hero developing his persona, before he donned his iconic hockey mask and machete. Back in the early days as he stalked the woods around the camp he wore a filthy sack on his head, and used an axe, this was quite effective as a start. The only way to go from there, was up, and out of the grave at least 10 more times … Kudos to Mommys Boy, congratulations on over achieving - all the way to outer space and beyond. MOMMY'S BOY is a collaborative release between KiD iNK iNDUSTRiES and Big Kev's Geek Stuff. 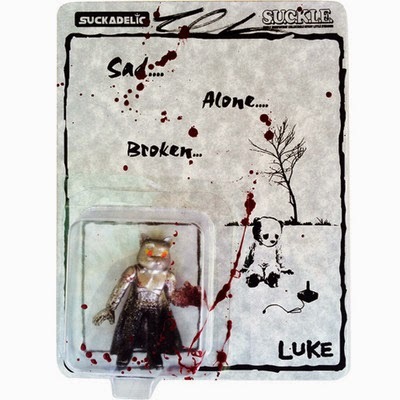 Each figure comes with a hand sewn bag to cover up that ugly mug and the weapon of choice, a bloody ax, all in a VHS-styled box and includes an authenticity card and prints for $45 each. Thirteen MOMMY'S BOY figures will be available on Friday, June 13th at 12 noon EST at Big Kev's store. As a bonus, there will be two chase piece claim tickets inserted randomly. One ticket will be redeemable for a gold edition MOMMY'S BOY and the other for a glow-in-the-dark chase. 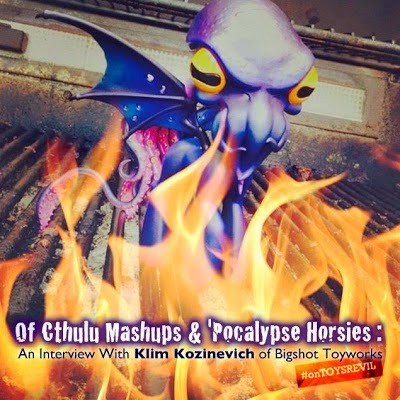 Check out Big Kev's Geek Stuff podcast for all the info and lots of geeky toy, movie and comic news! A face only a decapitated mother could love. What??? 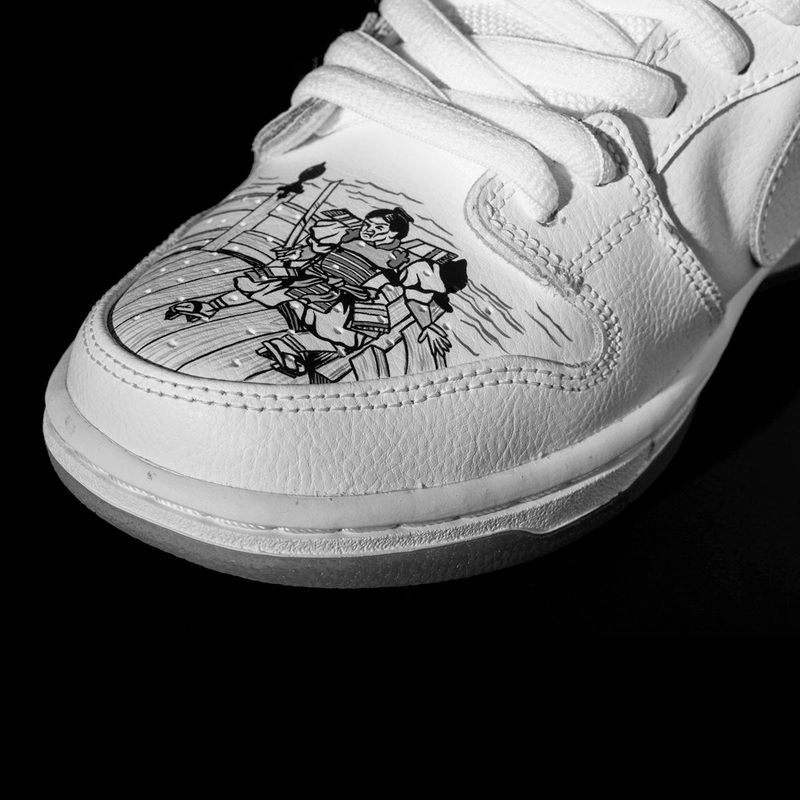 Customized Nike SBs on the Tenacious Toys Blog?? Why not, we blog about everything that tickles our fancy. 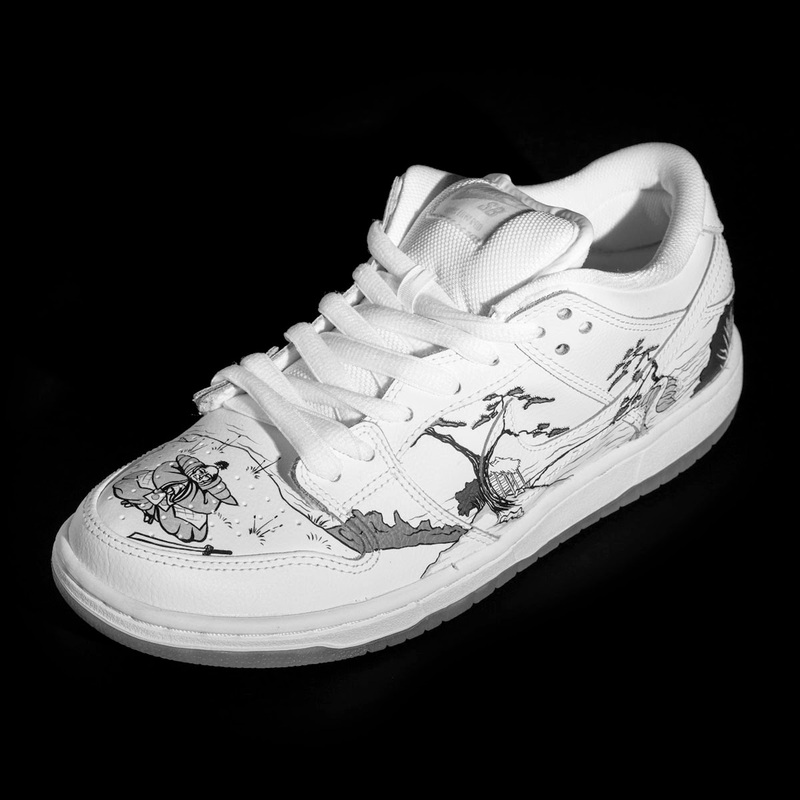 These mostly black and white Customized Nike SBs happen to be created by UK based artist Jon-Paul Kaiser. Last year, Jon-Paul Kaiser was fortunate enough to take a little vacation and visit the US during SDCC. During that time, Jon-Paul and his wife traveled California taking in the sites, eventually making his way to KR San Francisco for a signing. 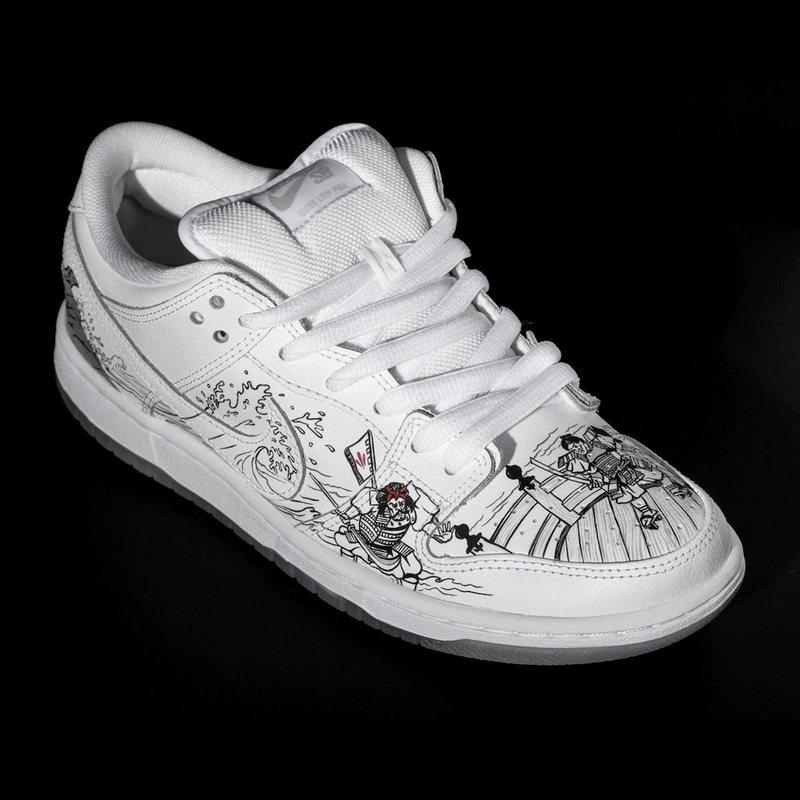 During his stint, Jon-Paul made some friends, one of whom sent him a pair of White Nike SB Dunk Low Pro's to customize. Not a typical medium often seen in the Designer Toy world, but also not too far off. 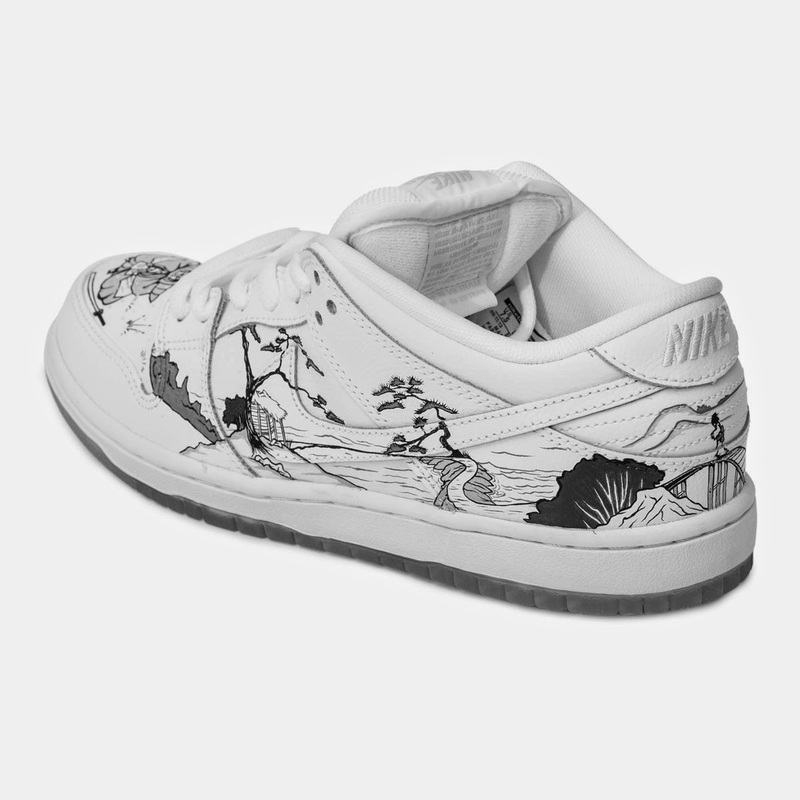 Many artists started out customizing shoes and eventually transitioning into other medium, while some still create custom shoes regularly. 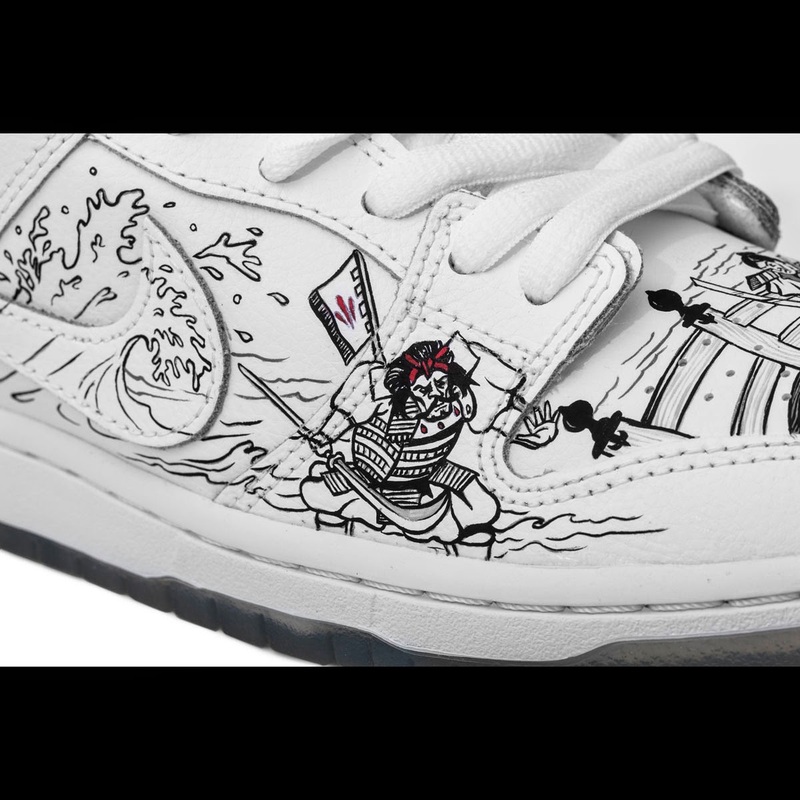 With these Nike SBs, Jon-Paul and his client decided to use the shoes as a canvas, rather than a typical character seen on Designer Toys. 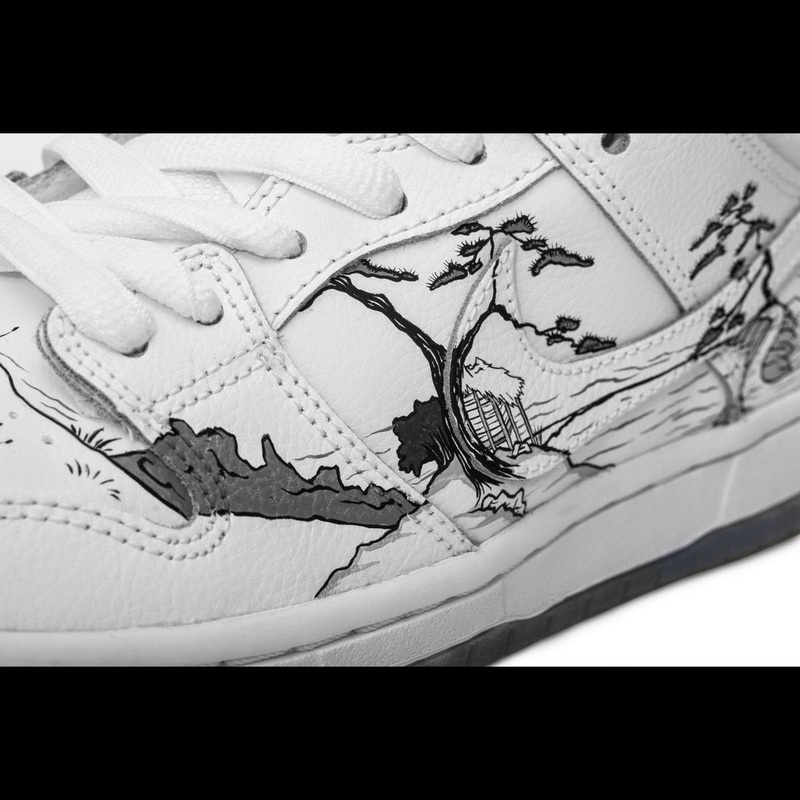 Each shoe has complimenting scenes going all around it and is nicely detailed, while being colored mostly black and white. 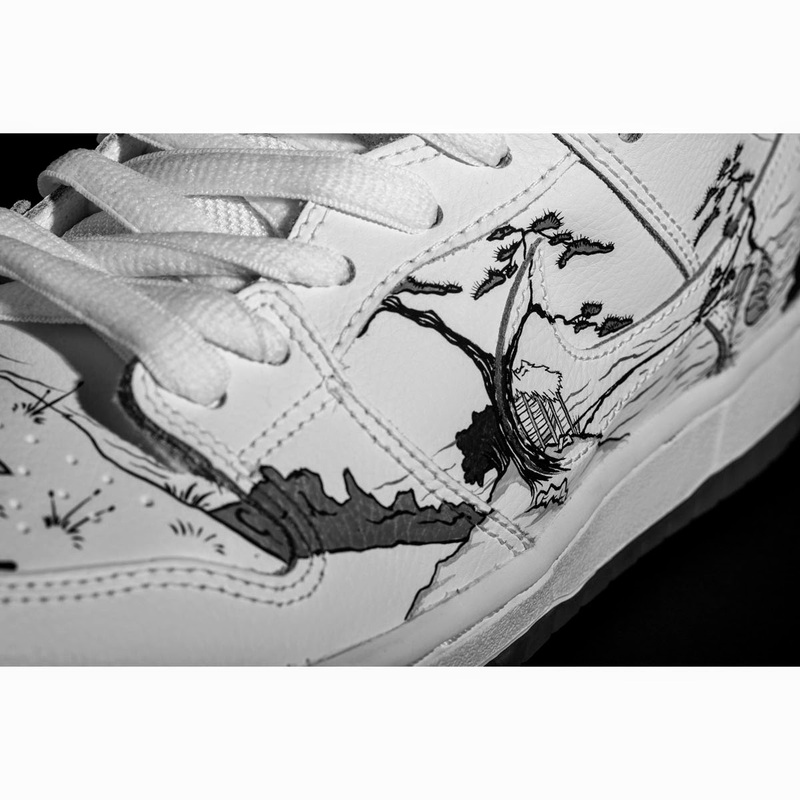 The white from the shoes and the black coming from Jon-Paul's extremely steady hand. Some Greys create nice shading, while a small amount of red has been added, creating a nice sudden pop of contrast. 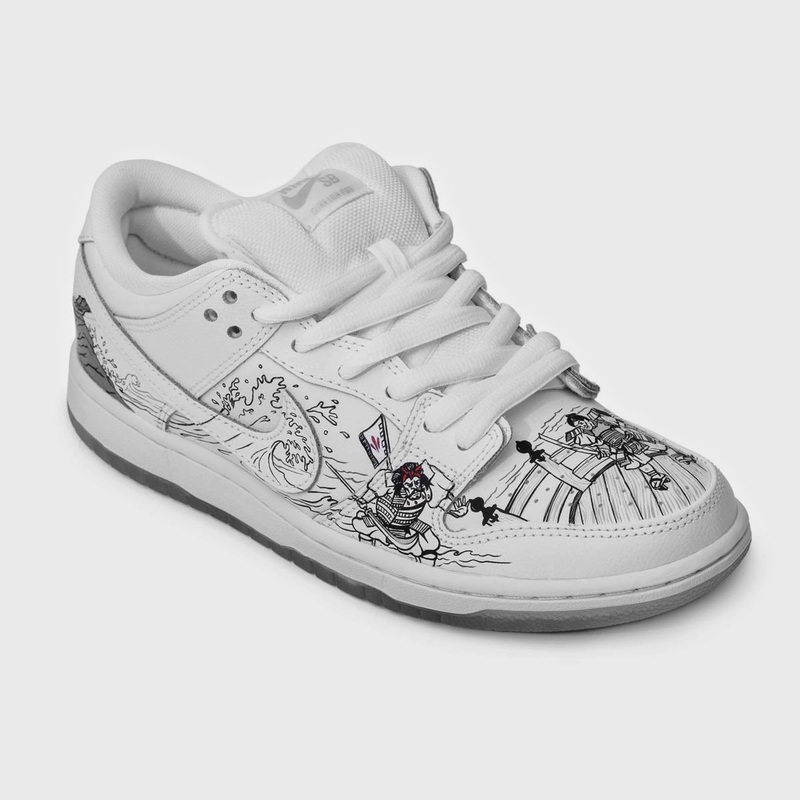 These shoes should be a nice addition to the client's collection. A big question remains however, Will they be shellacked and worn or just displayed?? 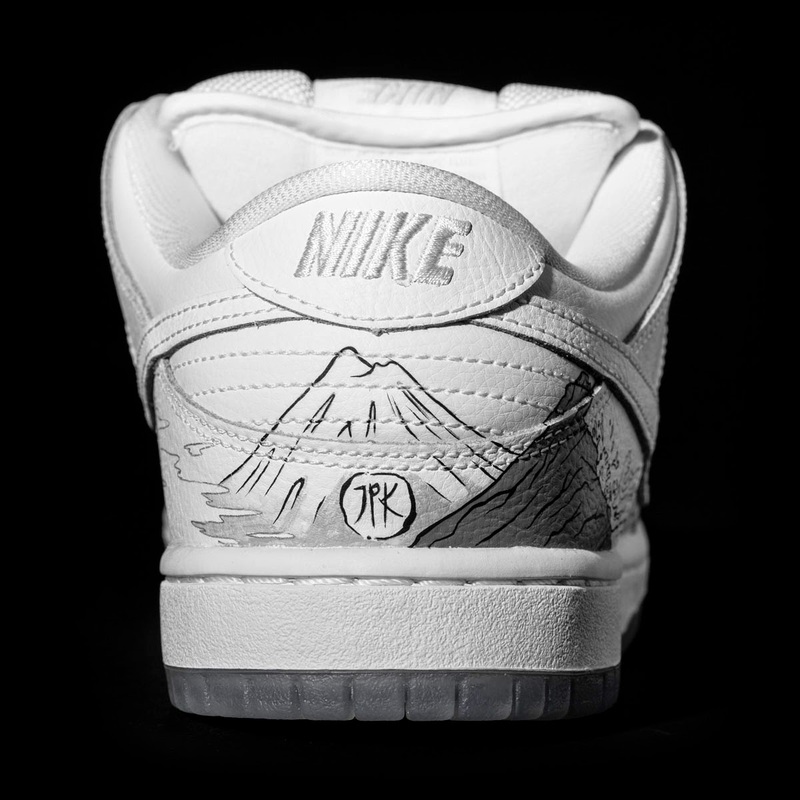 Photos were taken by Justin Allfree, a photographer who has taken many photos of Jon-Paul Kaiser's customs. Be sure to check out Jon-Paul Kaiser's other endeavor Rhyme Square. From what I gather, its a lot to do with rival gangs, please try and decipher the following links here, part One, Two, Three and Four - makes interesting reading with great artwork! Previous release was Zack Anderson..... the tailoring, the body, the accessories.... all top notch. And today I was sent info from the company of their next release, not one but two figures, so i believe the 'Top Notch' will carry on with future releases....... i.e. Dee and Mark Ash! Dee looking deadly in monochrome black and white, whereas Mark Ash is looking death in the face with a box of scalpel looking knives/blades. They just get better and better, like I said the story maybe hard to follow but the fact is the figures are so cool, quite a few collectors will want to buy either way!! Looking forward to getting these in hand as preorders will go live soon from JPToys and OneSixthBruce! Will put up more info as it comes available. The Brand New HAZARAI Has Arrived! Showing off your passion. Spotlighting your collection. Showcasing what you're selling. Displaying your work. Publishing your web comic. Or promoting your Kickstarter, just to name a few. You can even create "Group Racks" and invite others to post to them as well - something great for collaborative projects. We don't post a lot of Kidrobot around here. But sometimes the artwork and message is so profound that we make an exception. Such is the case Jermaine Rogers My Brother was a Hero. This place…these ancient woods that surround you: they belong to us. The trees that loom about you, silently granting you shelter and sustenance. The solitary, sun-spotted clearings where you filled the days of your youth with horseplay and dreaming. The cool streams snaking through this fertile landscape, where you quenched your thirst and bathed your body. It is ours - a sacred birthright. And it is worth any sacrifice. There is a message in this piece. There are many messages. The important part is what it says to you. DeeTen's latest, a commissioned piece, is the Atlantean Smasher, circa 1886. 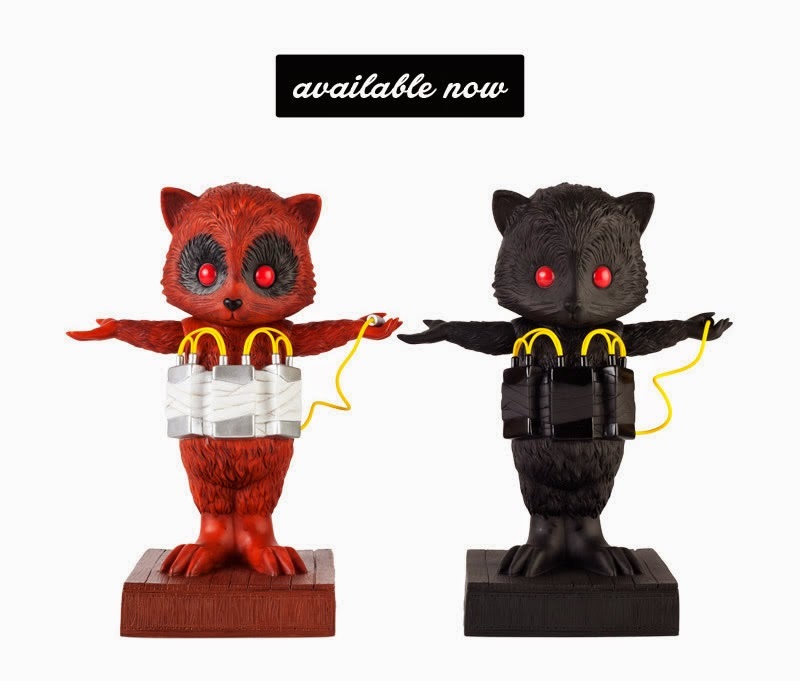 It features his trademark style combining vinyl, wood, metal and acrylic. It's finished off with a weathered look. You can see more of his work in his store. To support the Little Maddie Kickstarter campaign, we are offering up some sweet prizes to encourage backers to back at the $60 Maddie level- 3 Gummi Anatomy figures by Jason Freeny! I'm pretty sure many of you have seen the film... amazing stunts, no green screen, no special effects.... Just a bit of slo mo! No real details of yet but I just had to share with you Tenacious lot!! All info I have at the moment is pre ordering news will be available in August, and Toy Station will be the exclusive distributor in Thailand. George and Ayleen Gaspar of October Toys are resurrecting (see what I did there?) 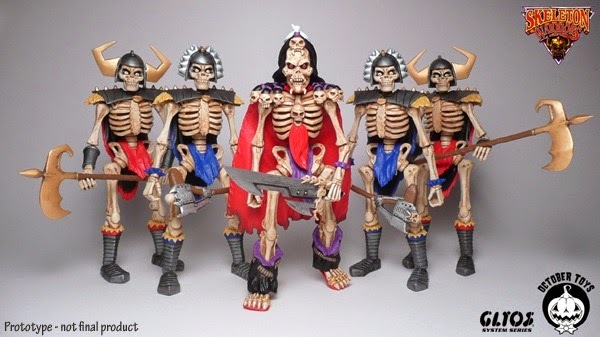 the 1994 Skeleton Warriors toy line. In addition to being AWESOME, these figures will be Glyos compatible! What does that mean? There are currently some amazing rewards starting at just $13 and a Baron Dark figure starts at just $25! But the stretch goals really put it over the top. Skeleton Guards, Skeleton Soldiers, PRINCE LIGHTSTAR and more! Shadoe Delgado has opened up his commission list starting on June 1st, for his 2014/2015 season of work. This time around, Shadoe Delgado has decided to introduce some new policies such as a "Wait Incentive" and a more open line of communication between the customer and artist. As art is now his full time job, Shadoe Delgado has planned to dedicate one week per commission. People who sign up for a commission will be issued a number, which corresponds to a week within the commission season. Keep in mind that size of the respective piece can also increase the amount of time needed to complete a commission, for example, an 18" Munny (or similar large scale piece) would require a month of time to complete. Of course, all of the time required and any delays will be communicated by the artist by striving to keep each customer in the "Loop". One thing about commissions is that unforeseen circumstances and situations do tend to come up. Even though Shadoe Delgado hopes to always keep customers in the loop, which should alleviate customer anxiety, he is also implementing a "Wait Incentive" for commissions that go a month or more past the projected week. For example, if a commission is a month late, the customer will also receive a small art piece, in addition to the commissioned piece. For longer waits, a bigger incentive will follow. In the end, Shadoe Delgado will try to be as transparent as possible with the whole commission process and hopefully be able to produce some killer sculpted work. For more info or to sign up for a commission, be sure to head on over to Shadoe Delgado's Website. 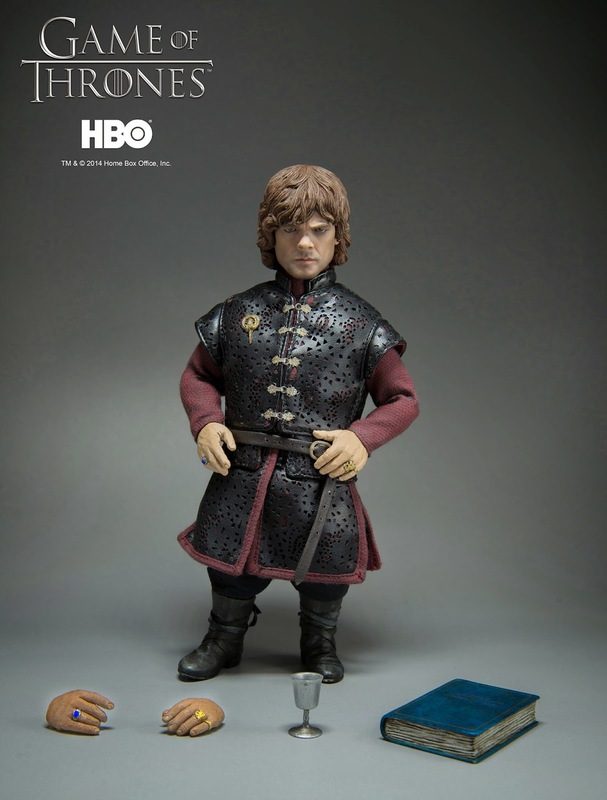 Scheduled to arrive in Q4 of 2014, this 22cm tall 1:6-scale Tyrion Lannister from HBO's Game of Thrones series is the spitting image of one of my favorite actors, Peter Dinklage. Comes with book, goblet and alternate set of hands. Plus a whole bunch of AWESOME. This will be $130 like most of the other ThreeZero 1:6-scale figures. Join our email list to be the first to know when our preorders go live, we're importing a really limited number.